In the previous post in the analysis, we observed that Lecktor, from his cell, has been regularly interacting with Dr. Sidney Bloom over the phone. With this in mind, let us discuss the meeting among FBI investigators and other personnel, at which they are going over the details of the analyses done on the toilet tissue note. At one point during this meeting, a man calls in from another location and reads the investigators what is ostensibly Lecktor's reply to the Tooth Fairy's note. The man from the documents department, Lloyd Bowman, writes down the 'book code' in the reply, which sounds like it contains biblical references, then the phone call ends. At the point that Bowman gets up to look in the bible, to try and start deciphering the code, we note that Dr. Bloom has a very concerned look on his face. 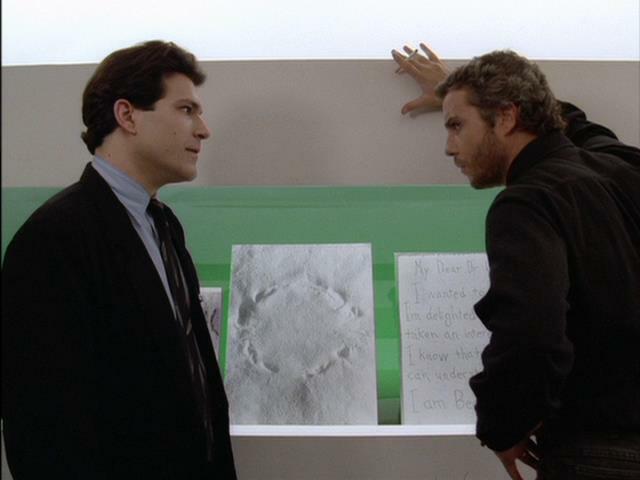 During the investigators' meeting, after Lloyd Bowman has recorded the book code, and has risen to look in the bible to check the coded references, Dr. Bloom (shown) looks very concerned. A little later in the meeting, Bowman finds that Lecktor was not using the bible for his book code. The decision is made to go ahead and run Lecktor's message as an ad in the National Tattler (which was Lecktor's intention), with the hope that Bowman will later be able to decipher the code, before the Tooth Fairy strikes again. Once this decision has been made, Crawford asks Graham what the team should do if, even after this, Bowman still can't break the code, and Graham responds that they should 'bait' the Tooth Fairy with himself. At this point, Bloom speaks out and says that he doesn't think that is a good idea. After the meeting, Bloom and Will have a conversation (shown at left) during which Bloom explains why he believes it is not a good idea for Will to use himself as bait for the Tooth Fairy. Bloom tells Will that his plan may work insofar as it might draw out the Tooth Fairy, but says that he is more concerned about Will's own welfare, insofar as his psychological condition. He tells Will that he is getting deeper and deeper into things, and he reminds him that the last time he went too far he got pushed out of shape; then he tells him that he could have a relapse if he continues along his current path or if he experiences a big trauma. At one point in the conversation, he refers to Will as "my friend." But is he really Will's friend? No; in fact, he is working against Will. Dr. Bloom and Lecktor have interacted with each other in the past, as we've said, and the two men are working together to push Will 'over the edge' psychologically. Lecktor is having Bloom help him carry out his plan for Will. Bloom doesn't want Graham to place himself in a dangerous position in order to draw out the Tooth Fairy, because he wants Lecktor's book code message to have its intended effect on Will - he does not know exactly what the message says, since it hasn't been deciphered yet, but he believes that the whole scheme has to run its course. If Will were to carry out the plan he suggested at the meeting, he might not be around to hear the deciphered message (i.e., if the Tooth Fairy were to get the upper hand and kill him).